At the Law Office of Leslie S. Shaw, A P.C., we have been aggressively, knowledgeably and effectively protecting the rights of injured workers for more than a decade in the greater San Diego, California, area. 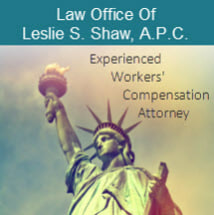 Workers' compensation law is all that Attorney Leslie Shaw practices. She is committed to seeing you get the help you need and the compensation you deserve. The best way to start is to request your free initial consultation with our firm by calling (866) 516-0548. Our free initial consultations are a forum for you to get your questions answered and to learn about your rights and deadlines related to workers' compensation. At that time we can assess your case and provide you with a general timeline of the process of your potential case.